Fans all around the world can enter the iOS game's new Crown Championship. Clash Royale might be compact enough to fit on your iPhone, but the game’s competitive ambitions are anything but small. Just last week, Supercell—the maker of both Clash Royale and predecessor Clash of Clans—announced the Crown Championship, a massive tournament that spans several months and will award more than $1,000,000 in prizes along the way. It’s an enormous leap in both scale and payout from previous Clash Royale tournaments we’ve seen, and it shows that Supercell is serious about trying to establish the game as an eSports sensation. That’s a lot of money for any competitive game, but especially so in the world of mobile exclusives, in which Vainglory is really the only other game with a strong following. And the best part about the Crown Championship is that you don’t have to be an established pro player to sign up: any high-level Clash Royale player can potentially sign up and vie for prizes when the tournament gets underway later this week. Here’s everything you need to know. Launched in March 2016, Clash Royale was an immediate App Store sensation—and one of our favorite iOS games of last year, free or otherwise. The cartoonish fantasy game pits two online players against each other, each with a deck of cards in tow. As your energy reserves build, you’ll toss cards onto the battlefield to spawn skeleton warriors, witches, giant fireballs, and other units and attacks, hoping to destroy your enemy’s towers before your own fortress falls. You can watch replays from top Clash Royale players within the game itself. 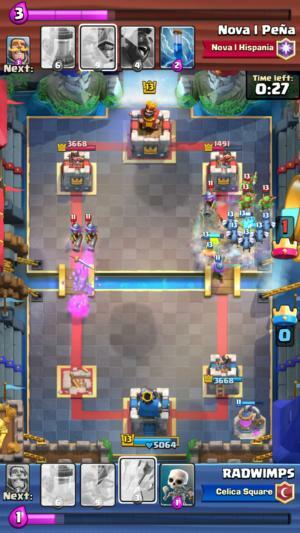 Clash Royale is essentially a blend of the real-time strategy, collectible card combat, and MOBA (multiplayer online battle arena) genres, and the resulting concoction can be remarkably addictive. With speedy three-minute battles, ample online competition, and one of the friendliest free-to-play frameworks on the App Store today, it’s a tough game to put down. It’s also perfectly primed for competitive gaming. Players must build a balanced and effective deck using the best cards they have—including powerful Legendary cards—and then put it into action against a real, unpredictable opponent. Skilled combatants have battle-hardened knowledge of how every character and attack works and when best to use them, and can swiftly unleash counterattacks and defensive maneuvers to keep their base intact. They know exactly which cards to use to defeat or even momentarily distract enemy attackers, giving them a leg up when a large army of foes suddenly spawns in view—or a chance to claw back some momentum when a tower is about to fall. The tense back-and-forth can be really exciting to follow, especially if you’re the kind of player who could take a few tips from watching high-level competition. You can watch replays of top showdowns from within the app itself, but large tournaments and live finals events have also been growing in size and interest. 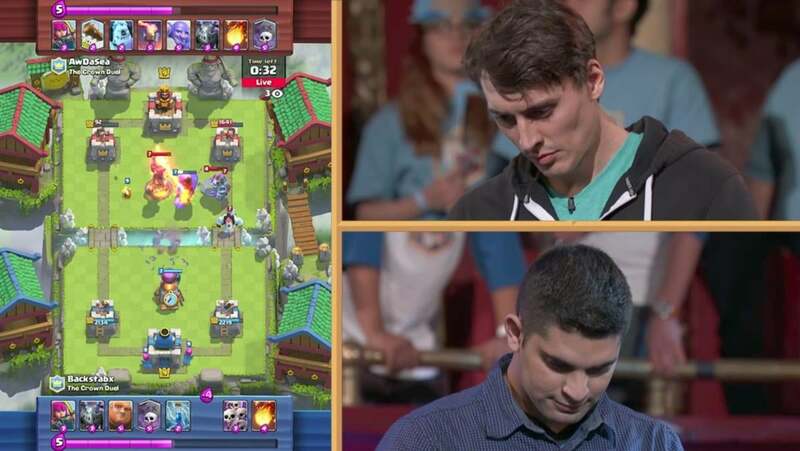 Last fall’s Clash Royale North American Open was a comparatively modest first eSports effort from Supercell, with more than $100,000 in prizes awarded throughout the tournament, including $15,000 for ultimate Crown Duel winner Backstabx from team Hammers Esports. Other international tournaments have been held (as seen in the video below), along with community and third-party events, but they feel like baby steps leading up to the next big thing. Clash Royale’s eSports reputation could enhance dramatically with the Crown Championship. For starters, the scale and reach of the tournament are significantly larger than Supercell’s last effort, as it’s a fully international tournament that is built to support up to a million participants in the open play phase. Anyone who meets the requirements can register and start playing to see if they’re good enough to progress into later rounds. And the rewards are likewise significantly increased. With a total promised prize pot of more than $1,000,000 over the course of the tournament, seriously skilled players could potentially take home thousands of dollars for playing an iPhone game. The Crown Championship kicks off this week with an initial round of open play. From May 11 to May 16, hundreds of custom tournaments will be available in Clash Royale on both iOS and Android, each supporting up to 1,000 players. 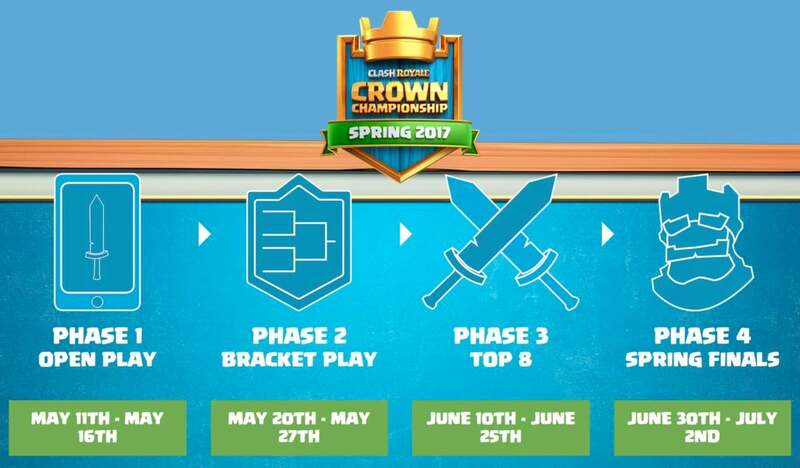 Once open play is complete, Supercell will choose the 8,192 top performers and push them along into bracket play. Here’s the schedule of events for the spring season, but there’s plenty more later this year. In bracket play, those players will be split up into eight new tournaments, each housing 1,024 competitors, and they’ll battle from May 20 to May 27 until one (yes, one) winner is crowned in each. Those eight winning players will then enter a three-week round robin battle to weed out the two weakest players, and the six players who still stand in each region will then fight to be the ultimate winner in the Spring Finals from June 30 to July 2. Spring Finals? Yeah, it’s just the beginning. A new fall season will kick off in August and span a couple months’ more of play before a live World Championship event in London in November. Only then will a proper Crown Championship winner be… well, crowned. The six best spring season players in each region will gain automatic entry to the fall season, with $15,000 awarded to the top player along with smaller sums for the rest of the Top 8. It’s extensive and elaborate, but the potential rewards seem worth the hassle if you have some serious Clash Royale skills and you’ve already been showing them off in the game. Players in China, Korea, and Japan are already playing in associated events, but you can still sign up for the Crown Championship if you’re in North America, Latin America, or Europe. Additional regions will be added to the Championship this fall. Crown Championship play here gets underway this Thursday, May 11, which means you’ll need to sign up pronto if you want to pit your deck against the world’s best. If you are at least 16 years old by the 11th and you have a level 8 account in the game—which means you’ve played long and hopefully impressively enough to hit that high mark—then you are eligible. 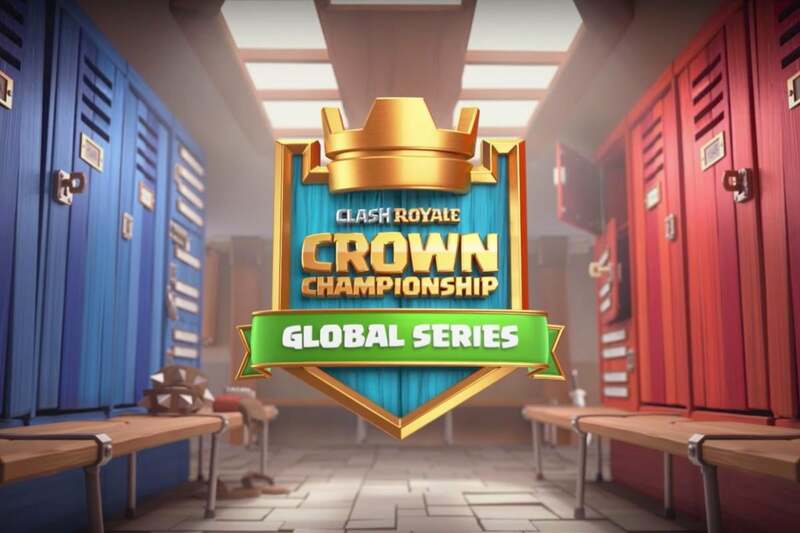 Simply visit the official Crown Championship website, pick your region, and sign up. You’ll be able to play tournament matches through the Clash Royale app right on your iPhone or iPad later this week. Just be sure to read the extensive rules. Here’s a shot from the Crown Duel in December. The Crown Championship’s video streams may have a similar look. And if you can’t or don’t want to compete, or simply prefer to watch, then you’re in luck: Supercell will broadcast matches live via Twitch, YouTube, and Facebook starting with the Top 8 on June 10 through to the Spring Finals on July 2. By the time it’s whittled down to eight players per region, you’ll truly see the best of the best in competitive Clash Royale. And broadcasts will surely resume with the fall season and the eventual live championship event in November. Whether you plan to watch or play, the Crown Championship is sure to be a major draw for all fans of Clash Royale, and could propel the on-the-go favorite to new competitive heights that we haven’t yet seen for mobile games. We’ll just have to wait and see whether the actual battles warrant the hype, let alone all the money that Supercell is about to throw at them.